It is the kind of stuff that legends are made of. One woman took on the state of Delaware to champion the right to make wine in a state that did not allow the production and resale of alcohol. It almost sounds like a film plot, but that is the story behind Nassau Valley Vineyards. Peggy Raley got her start working for Les Amis du Vin International and The Friends of Wine magazine. As her understanding of wine increased, she gradually decided to make her own wine. Hers was not a home-winemaking venture, Peggy was interested in commercial production. In 1987, she began planting nearly seven acres of vinifera on her property in Lewes, Delaware (near Rehoboth Beach). Of course, as I mentioned earlier, the state prohibited production of alcohol. So in 1991, Peggy went to the legislature and successfully challenged the law. She then opened Nassau Valley to the public as a joint venture with her father Bob Raley in 1993. Today, Peggy and her sister, Suzette Hopkins, are partners in the winery and share responsibility for day to day operations. It has stabilized as a medium-sized boutique winery producing between 2500 and 3000 cases of wine annually. The business evolved to include weddings and corporate functions, but wine is the main event. Since they first opened, the winery has earned more than 400 medals in international competition. 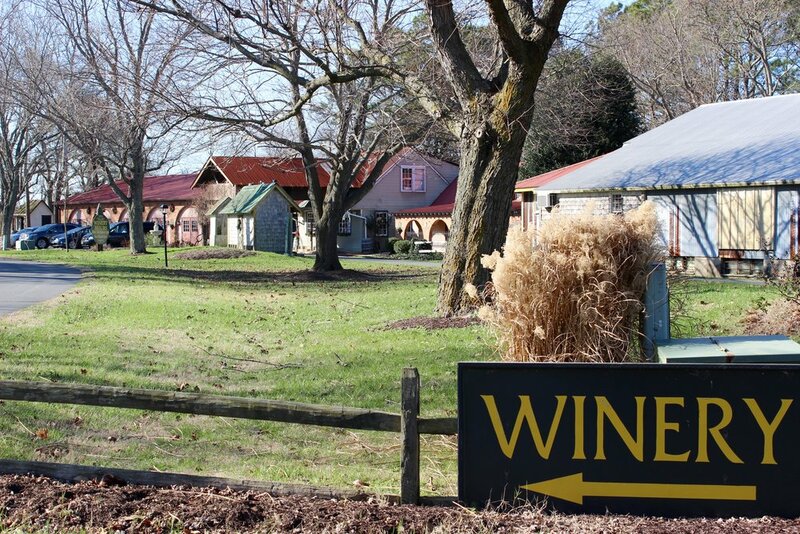 Aside from being Delaware’s first commercial winery, It is also accurate to say that Nassau Valley is the best and most highly regarded winery in the state. I happened to be staying in Rehoboth over New Year’s and decided (as I nearly always do on Saturday) to visit a winery. I knew nothing about Delaware wine and it was just dumb luck that I stumbled into Nassau Valley. The event coordinator, Jessica Roseberg, was on duty in the tasting room, so she came out to pour wine and answer questions. I will say, however, it was really a conversation with the entire staff. I found all of them to be gracious, customer oriented and knowledgable. The entire tasting experience was first rate. The winery sources some fruit from New York and other east coast vineyards. There are not enough commercial vineyards in Delaware to support demand. I will point out that I was interested in tasting only estate wines of which there were five on the tasting menu. I started with a lightly oaked Chardonnay before moving on to the reds. Among these were a Merlot, Cabernet Sauvignon and a pair of Bordeaux blends. I will say that all of the wines were well crafted and as good as any wines I might find in Virginia, but the Vintner’s Blend was absolutely spectacular. It had a nose that filled with notes of black cherry and leather. On the palate it was very fruit forward with firm tannins and a finish that just went on and on. If it has not won any medals, it is destined for gold. After the tasting, I wondered about the grounds and took the self-guided winery tour. Part of the building complex that houses the tasting room is designed as a museum filled with winemaking exhibits. It is a fun little trek that eventually winds back to the tasting room. From a wine-education standpoint, I have to give Nassau Valley very high marks. The combination tour and the tasting bar presentation are ideal for educating visitors about not just Delaware wine, but wine in general. I am exceptionally happy that I chose to visit Nassau Valley Vineyards. It is an excellent example of an east-coast winery. If you live in Delaware, you should absolutely support this winery. If you are ever in the area and you have any interest in wine, I strongly urge you to stop in. When you do, please let me know what you think. As of this writing, there are only four wineries in the state of Delaware. Previous to a recent trip to Rehoboth Beach, I had visited only one. So I am happy to say I have now visited half of the state’s wineries. Since the move from the old Fenwick location there has been some fluctuation in production, but the long-term goal is to make 2000 cases annually. In order to do this, they need fruit. The 2 acres of young vines are not yet producing, but the plan is to concentrate on red varietals and source white grapes/juice from the family vineyards near Erie, Pennsylvania. Adrian does not dismiss the idea of growing whites as well, but it needs to be grapes that do not grow further north. The menu is currently a little light on reds. The single-variety Syrah, however, was my overall pick. It is medium bodied with a beautiful nose, dark fruit, a bit of complexity and a medium finish. It sheds light on what we may expect as the vines mature at Salted Vines. At their tasting room in Selbyville, the Mobilias received largely seasonal tourist traffic. The new location for Salted Vines sees some tourists, but there is more of a regular local following. A host of regular patrons bodes well for the future and also speaks to quality of the wine and tasting room experience.